Well….I am definitely doing better. In the last week, I have not only swept my house twice (this is huge - not my house, but the fact that I swept it!!!!!! ), but I have also not let the dirty dishes take over my kitchen (as they are extremely wont to do). AND I even changed the bunny litter box once. Of course, I still have yet to make my bed (brutal, eh?) and I have been walking *around* a full box of recycling fodder for a week because I am simply too freaking lazy to drag it outside. Since I have been such a total procrastinator, I will update you with my domestic achievements since we last spoke. I successfully made my first cheesecake. Not only was it a fabulously chocolatey cheesecake, but it was low-fat. Do you hate me yet? Hehe. I highly, highly, highly recommend the “Eat, Shrink & Be Merry” cookbook. You too can be a domestic goddess. :) The only truly disappointing aspect of the cake is the MASSIVE crater-like crack that crept across its surface as it cooled. So sad. Thankfully, I figured out how to cover it up. A thin layer of ultra-low-fat cool whip (woo-hoo for hydrogenated, man-made ingenuity! 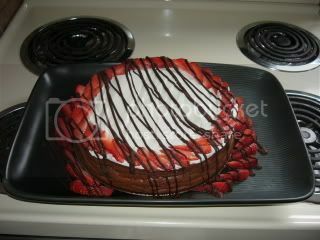 ), some thinly-sliced strawberries, and some drizzled chocolate. Oh ya. Eat it and weep baby. I also even managed to take pictures of my living room. Not only is there no clutter (you have no idea of the challenges of keeping that damn table clear), but it’s starting to look fabulous. To me at least. I’m sure there are those who would perhaps take exception to my orange room. I love it though. You know, it was funny, I just recently read a post of someone who had just repainted their entire house in Benjamin Moore paint. I could tell she had really put a lot of work into the whole colour scheme…but you know what…I hated it. The whole damn house was SO neutral, it didn’t look like a real person could possibly live there. I know that neutrals are in, and I am well-aware that no sane individual would ever buy my house with the living room the way it is…but to paint your whole house in BEIGE? Ack. I just love this room. It’s our formal entertaining room (and also the entrance to our weeny house). We use this room mostly at night, and it just looks so fun and warm and cozy in candlelight. Anyway, you be the judge. 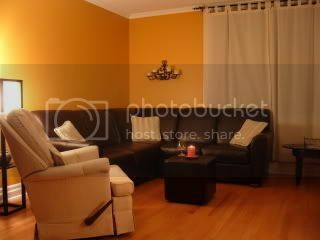 Also, I am desperately seeking some funky awesome painting to hang above our couch. Haven’t found it yet…any ideas? We have a new dining table on order. Our current one photographs pretty well (believe me, this pic is WAY better than reality), but honestly looks as though a large rodent (a beaver, perhaps?) munched on the legs of everything. Two of the chairs are broken, the cushions are green and the top of the table…well…let’s just say that I am developing a fabulous collection of tablecloths. With no further ado, this is what my living room is SUPPOSED to look like all the time. Very rare that it looks like this. We’re still looking for the right coffee table, and I really want awesome pillows for the couch – shades of orange raw silk would look cool, I think. And here is the ‘dining’ half of the same room. I love that room! We have very similar taste. 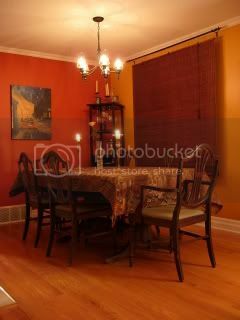 The yellow and orange work really well together and I absolutely love the table cloth! Hey, by chane is that a Minto Montant or Captiva? It looks just like my first floor (layout wise I mean. Mine isn't nearly as neat). "The only truly disappointing aspect of the cake is the MASSIVE crater-like crack that crept across its surface as it cooled." My mom emailed the Podleski's about this and they emailed back that there is absolutely no way around it. It ALWAYS happens. Love your idea to cover it up! That looks like a delicious masterpiece. Was it a hit at the potluck? Anyway, I'll be looking forward to updates! Oh, and your living and dining rooms are gorgeous. Marlene, the cheesecake was a HUGE hit. I was concerned, because I didn't think it would taste cheesey enough....but it totally rocked. Polkaroo, I don't think my house is a Minto. I'm pretty sure it's a Campeau - it's old though (1961ish). Our house is a semi, shaped like half of a "U" with the carport in the middle. I'm getting bored. I shall post a pic. A tip for the cracked cheesecake: Next time try placing the cheesecake pan in another pan or oven safe container filled halfway with water. My mom does this and she has perfect cheesecakes every time. I love your blog but I have to comment on your beige comment, as a self proclaimed neutralist. I really hate how some use the word beige as though it is evil or something... I personally think interest and texture can be added elsewhere, and I hate that people seem to be so opposed to people that enjoy neutrals. Although your orange is not my cup of tea, your room looks very comfortable and nice. Also please don't be offended but you may want to lower your candelier. It will create a cozier effect in the room. I love the modern flair of your house.